What Are the Benefits of Taking Fennel Capsules? Holy basil, a small shrub with scented leaves, is widely used throughout south Asia for purported medicinal purposes and as an herbal tea. Ayurvedic medicine regards holy basil as an adaptogen -- an herb that brings body systems into balance and increases resilience. Scientific studies have supported the use of holy basil for some health conditions. Consult a qualified health professional to determine the most appropriate course of therapy for your needs before supplementing with holy basil. Cultured holy basil showed more antioxidant content and activity levels than field-grown plants, in a study published in the October 2007 "Journal of Agricultural Food Chemistry." The researchers identified rosmarinic acid as the primary antioxidant in the cultured holy basil samples. Cultured samples showed higher activity than field-grown samples at scavenging free radicals and tested higher in several other antioxidant parameters. The researchers concluded that cultured holy basil may possess superior antioxidant capacity compared to the field-grown variety. The September 2007 issue of the "Journal of Medicinal Foods" published a study that showed holy basil possesses significant detoxifying ability. In the study, researchers gave holy basil leaf extract in doses of 100 mg, 200 mg, 300 mg and 400 mg per kg body weight to laboratory rats for five days prior to exposure to a toxin. 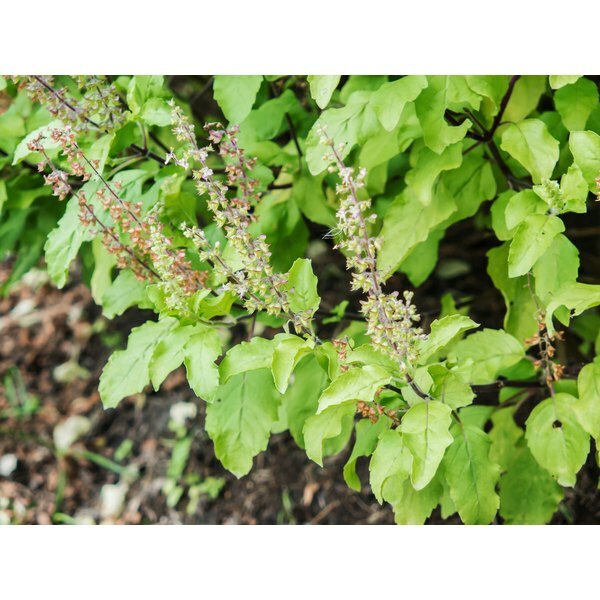 Holy basil dosage of 300 mg per kg protected the rats from liver damage, inhibited the oxidation of lipids and proteins and enhanced the activity of liver-detoxifying enzymes. A study published in the September 2007 "Journal of Natural Products" announced the discovery of three new active compounds to go along with the eight known substances in holy basil. Scientists tested the new substances at a dose of 40 mg per kg body weight on laboratory rats that underwent acute stress and observed promising stress-reducing effects. Some of these compounds reduced blood sugar and cortisol levels, conserved energy production and decreased adrenal size, indicating holy basil's significant anti-stress capability on several levels. Holy basil may be useful to prevent seizures, according to a study published in the 2003 "Indian Journal of Experimental Biology." Scientists gave extracts of holy basil stem, leaf and stem callus -- cells that form at the cut surface of a stem -- to laboratory animals and observed significant anticonvulsant activity compared with the standard antiseizure drug phenytoin. Fatty acids in holy basil show effective anti-inflammatory properties, say authors of a study published in the June 2008 "Indian Journal of Experimental Biology." Holy basil contains high quantities of the omega-3 essential fatty acid alpha-linolenic acid and produced the greatest inhibition of inflammation when tested against flaxseed and soybean oil in the study on laboratory rats. What Supplement Is Best for Rapid Weight Loss?